The ACTU wants to make a temporary LNP-fighting fund into a permanent fee for members. The ACTU will seek an extra $10 million over the next three years by increasing the amount that unions pay to the peak body. Reports say the money will go toward campaigns in marginal seats against the Abbott government at the next election. Union leaders expect ACTU secretary Dave Oliver to win support for the annual increase in affiliation fees from $4 to $6 a member, when it is discussed at this week's ACTU Congress. 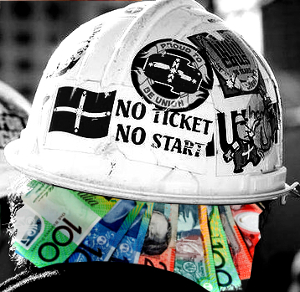 With 1.74 million union-affiliated workers nationwide, the increase should deliver an extra $3.5 million a year into ACTU coffers. Union members have paid an extra $2 campaign levy in addition to affiliation fees since 2012, and Mr Oliver's move seeks to collect that extra revenue permanently. There has been muted dissent among union leaders, some of whom would prefer the money be spent exclusively on their own industrial and legal battles. “Several union officials” have told Fairfax Media reporters that their unions will consider reducing their declared membership numbers, so they can pay less to the ACTU. There are also claims that the ACTU has plenty of cash reserves to finance the campaign against the Abbott government already, and could afford to delay the fee increase. The fee change is just one of many measures in a draft policy platform to be considered at the ACTU Congress. The policies include a range of legislative changes that the unions could take to the ALP national conference in July. The 104-page document seeks to permit legal industrial action in support of industry-wide pay claims by changing the Fair Work Act. Report say unions also want the right to take industrial action, with no secret ballots, before bargaining starts. The new policies could also boost the bargaining position of the Community and Public Sector Union, by making legal changes to force “intransigent” government departments to enter into arbitration when bargaining with public sector unions. In a move that will almost certainly be strongly resisted by the Federal Government and small business community, unions want to get rid of all employer exemptions in unfair dismissal claims. The unions appear to be getting serious on their “truth in bargaining laws” push, by proposing new laws that would force employers to hand over financial information during bargaining. Another draft policy would see entitlements paid to workers based on years of service across an industry, not just time spent with one employer. The policy document calls for employers to start topping up paid parental leave, it while increasing “Dad and partner” paid leave from two to four weeks. The unions want an extra 10 days' paid leave for workers experiencing domestic violence as well. They also want to remove the union obligation to give 24 hours' notice before entering workplaces, or to give notice to access company documents when investigating workplace safety. And finally, the ACTU wants three working days' “clear notice” of an employer’s intention to lock out workers.